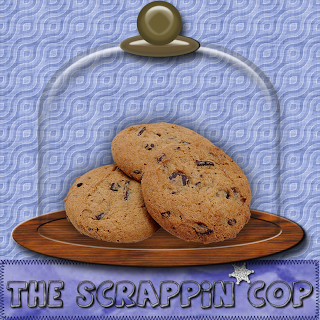 The Scrappin Cop: New Blog Look and a CU Glass Display Dome! New Blog Look and a CU Glass Display Dome! Hi all! Notice anything new? LOL. I love my new blog header - don't you? I want to thank my new friend Exotic Mommie at Divalicious Designs for the awesome Header and buttons she created for me. She actually created an entire template and it would have been awesome except I am so html challenged when I tried to update my blog with the new template it lost something in the translation! Like everything got lost! All my little thingies on the sidebar were gone and I had to remember what I had on the side to add again. And I did download the current template before I tried to update it but found out too late that the widgets aren't saved when I do that. Anywho, Please stop by Divalicious Designs and see what she can do for your blog! I really appreciate the awesome graphic, wish I was really that skinny! LOL. And another dear friend from my ADSD Yahoo Group came up with a blinkie for me that is so cool also! Thank You Kimberly! Please also visit her blog City Scribe Scraps to see the awesome talent she has! And feel free to grab one of my blinkies if you care to post it on your blog! And for something different today I made a glass dome display with a wood base for your previews or kits. I have lots of requests for more animals and I have them all saved on a text file so I will try to get to them as I have time! The display dome is in .png form and the cookies are for preview purposes only! (You have to bake your own! LOL.) I hope you can use it! Oh so cool! Thanks for sharing! Love the dome jar thanks. Also the new header is really cool. Your new look is really cute! And I love that you gave us a display piece, and an unusual one. It's really nice, thank you very much! I just wanted to say thank you SOOO much for the dome. It is a running joke on my blog about my crummy previews, I think this will help a great deal to improve their looks! Thanks Deb. This is great. I guess now I will have an excuse to bake cookies. LOL Love the look of your blog. That cop is too cute. oh, this gets the creativity juices going... what to put inside? How fun this is! Thanks so much. I just love all you Glass Containers. thanks for another Great Glass container!